There is more to this beautiful poem by W.H. Davies but I am really astonished at how these lines convey exactly how our lives have become these days. But that is not why I was reminded of this beautiful poem. And, the reason why it crossed my mind? Well, we got to do all those things mentioned in the poem – stand beneath the bough and stare at the beauty that we call nature, the streams (only that it was a lake this time) full of stars in broad daylight that looked like skies at night. So yeah, this time it is not a continuous learning session, but an exciting camping trip. Our company turned 4 this year and we were all in a mood for celebrating. 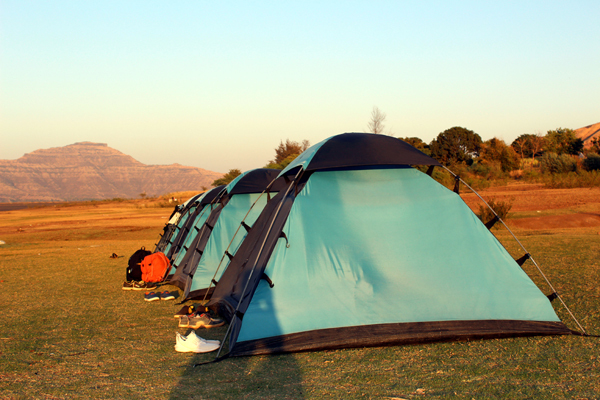 And what better way to celebrate than a camping trip. After a lot of discussions about the destination about the way to reach and do all the residual formalities,Wai was selected. Wai is a beautiful town located in Satara District of Maharastra and is nestled in the midst of the Sahyadri mountain range with Dhom Dam and Mahabaleshwar at it’s West, Khandala and Koregaon at it’s East, Pune in North. 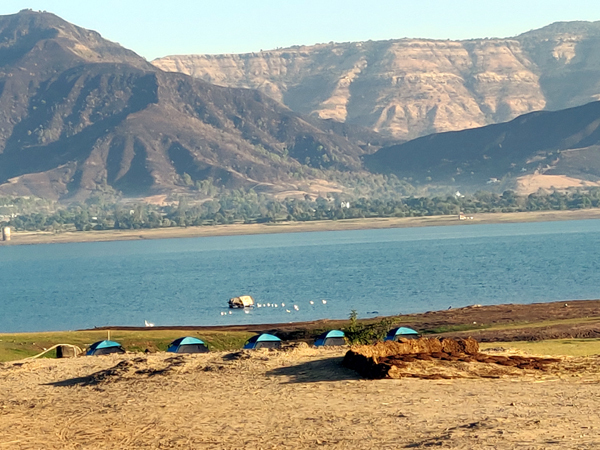 Also called DakshinKashi due to its 100+ temples and ghats on the banks of the Krishna River, Wai has a campsite that offers lakeside as well as mountain views. For us, it was a mere 25kms away from the Pune-Mahabaleshwar highway. So once the spot was decided, the hustle was on to book a vehicle for the trip. We needed a vehicle that could accommodate the 15 of us. We settled on and booked a bus. We just couldn’t wait to reach Wai. We started from our office around 6:30 am in the morning and reached Mahabaleshwar around 11:30 am. It was the time for breakfast! We had a break and a breakfast at Mahabaleshwar and then continued our journey to Wai. It took us an another hour to reach the place. As we set our foot off the bus, it was as if we had stepped into a magic kingdom. It seemed as if some wizard has woven his magic to captivate us in his beautiful kingdom – it was as if we were in a fairy tale. The mesmerizing view of the Sahyadri, the Dhom Dam, nature lead us to a delusional form of serenity and serendipity. We could all feel our souls melting to her beauty. Add those little tents at the campsite to this picture, we were already tuned in to the relaxation that the place promised us. The peace that the place promised us just from the looks of it was divine. We met the owner of this privately owned campsite. He was friendly and made us feel very welcome with his two pet dogs beside him. And right at the moment, it turned out not just to be a nature’s paradise, but a dog-lover’s paradise as well. What more do you need to feel relaxed? We spent the entire day relaxing in a unique way. We went back to our childhood. We played all those childhood games that we had lost somewhere while growing up and learning the ropes of life. We played Antakshari, Game of Seven, Dogs and Bone, etc. to our hearts’ content. The evening was even better. We arranged a small barbeque party, thanks to the campsite owner. 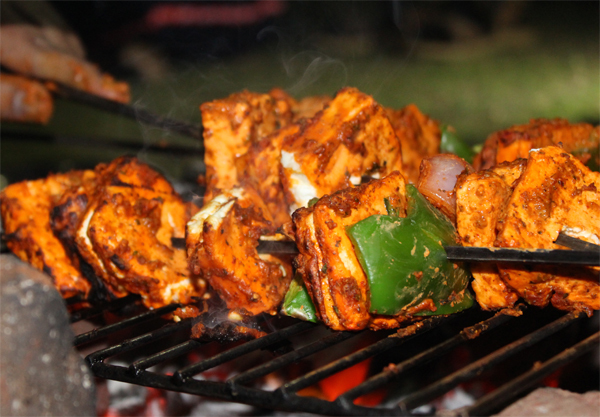 As with most barbeque parties, Astha and Laxmi ended up barbequing the veggies. The rest of us wanted to help but we all got busy gorging on the yummy barbequed stuff. Yeah, I say stuff, because we stuffed ourselves with all that delicious food. With our stomachs full, it was now time for stories. And what better stories can be there apart from ghost stories when you are sitting beside a campfire? Each one of us had our own ghost stories to share. Some scary, some not so scary, and soon it was time to sleep in those quaint little tents that I told you about. Not sure, how many of us could sleep soundly after all ghost stories! Even next morning I saw a couple of face which seemed weary from lack of sleep the next morning. The morning brought its own share of exciting activities. We went boating on the lake and had a lot of fun there too. Before long, the clock struck 12 and it was time to say goodbye to the nature and Wai. As with all good things, this one too came to an end as we boarded the bus to Pune and our routine lives in Pune. This time you are wrong, Davis! We did enrich it all at Wai, which we can never forget! PrevPreviousMeditation As A Palette Cleanser!